Gulf Stream Cafe does not have any reviews posted yet. Be the first and post one below! Because I don't eat sea food I only had two other choices. I ordered the half chicken dinner. It was the worst chicken I've ever eaten. Small, over cooked, meat very dry what little I could scrape off the bone. A very poor entree. Why not serve a grilled chicken breast? We were thrilled with our entire experience at Gulf Stream Café! We were quickly seated. Our Waiter was fabulous, so cordial, kind, & informative (even of the area!). He even didn't mind that we move to a window seat that became available before our meal arrived! The Early Bird Special of Tilapia was delicious and the price was great. After our meal we wandered up onto the upper decks as the sun was beginning to set - gorgeous!!! We would recommend this restaurant above other local eateries and to anyone. Can't wait to return! Great service. Excellent food preparation. On this day was able to be seated without waiting. Waitress was outstanding. When asked about the crab cakes, she said they were very good. We both got them and found them to be among the best we've ever had. Outstanding isn't enough good to say about it. We had reservations and we asked for a window table. When we got there the very unfriendly hostess seated us by the door. We asked to be seated at one of the many window tables available. She rolled her eyes and reluctantly led us to another table. The menu was very limited and the food was average. My sister got the shrimp and flounder and her flounder was nothing but fish scales and very unappetizing. The kicker was that we were with a party of 6 and unaware of the tipping included on parties of 5 or more. When we paid we all, three couples, left a tip and the waiter failed to mention that it was already on the bill. I think this is very underhanded and we will never go back to the Gulf Stream. We have a house in surf side and visit many times during the year. Save your money and go elsewhere there are too many other good places. And if you are reading this Gulf Stream.....tell your hostesses it wouldn't hurt to smile and be friendly to the customers. This was our last meal at the beach for our week. It is also the last meal we will ever have at the Gulf stream Cafe. We were greeted by a very unfriendly hostess. I don't think she even talked to us let alone smile. We had reservations requesting a table by the window. While there were tables available by the window we were shown to a table right by the door. We then asked the unfriendly hostess if we could move and she reluctantly found us a new table. We were served the bread basket but only one of us had a knife. Good thing we like each other. My sister ordered shrimp and flounder and her flounder was nothing but dark skin. Yuck! The waiter was not very good either. He couldn't keep us straight and we waited a long time for him to come around. The final insult was the added 18 percent gratuity for parties of 5 or more which was microscopically printed at the bottom of the extremely limited menu. The joke was on us as the waiter took our 20 percent tip on top of the 18 percent already assessed on our bill, and never told us. He's laughing all the wY to the bank. We spend a lot of time in the area as we own a home here. As soon as we returned home we threw away the menu from Gulf Stream that we had in our suggested restaurant folder for our friends and relatives who visit. We will never ever return to the Gulfstream. What happened to this place?? We have been going to this restaurant for years, however, our last two visits this year have been very discouraging. On our last visit we were very disappointed. First, the menu has been significantly reduced to only limited items (one page) and the prices have also been raised noticeably. We came to dinner without reservations and were pleasantly surprised with no waiting, a sign of bad things to come. The restaurant was only half filled and there were plenty of serving staff, however it took 10 minutes to be asked for our drinks after we were seated. Another 15 minutes passed before we received the water we ordered and then another 8 minutes before our waitress returned. We ordered an appetizer that took another 18 minutes to get and had not yet ordered our dinner. After we finally ordered our meal it took another 22 minutes to actually get our food which was not what we ordered and burned. Rather than complain we elected to eat and call it a day. After more than an hour (and a $60+ bill) we were ready to leave and will not return anytime soon. The Green family should be proud! As restaurant owners, we love the early bird special at the Gulfstream! Food is very good and reasonable priced! The sunset is priceless!! Went for the early bird special can't beat the deal: Jumbo bourbon cocktail Shrimp appatizer & Fried Shrimp just right crispy on the outside and tender on the inside. Service is always attentive and on task. Will always make sure recommend to friends visiting Murrells Inlet. Special thanks to Melissa our waitress! Certainly off the beaten path, but well worth the drive! Excellent food surrounded by an incredible view of the Murrell's Inlet marsh. Only been there once, but thr first impression was perfect! Very casual with an upscale menu. Make this a stop on your vacation to Myrtle Beach!! You will not be disappointed! The Gulf Stream has always been consistantly great! The food is well prepared never over cooked and served by a really good wait staff! EARLY BIRD is the BOMB!!! 4 to 530 half the portion...half the price.... and I promise you will not leave hungry!! Location is Wonderful inlet an ocean views. Check it out ...an I promise you'll come back!!! Ate there last night. I recommended the nobody EVER order the SHRIMP BASIL. It is tasteless. The noodles and shrimp is tasteless. The tomatoes taste like tomatoes but that is the only flavor in this entre. My wife had the fried seafood platter and that was very good. However, the Shrimp Basil entre should be removed from the menu. To pay over $20 for it was very disappointing. A good place to go. Arrive very early as the place fills up quickly. Parking is very limited. Be careful with tipping - the tip is included with your bill with parties of 5 or more. Most of the waiters do not tell you this and many people double tip. Went for the early bird special can't beat the deal: flounder fried just right crispy on the outside and tender and flaky on the inside. Have had the king crab legs yummy,my family loves the Grouper Francais and must agree it melts in you mouth Service is always attentive and on task. Always make sure there is at least one meal eaten on each trip. By far my favorite restaurant in the area. I went with my girlfriends and we enjoyed the food as well as the wonderful atmosphere. The view was breathtaking. Would definitely recommend it to anyone! Awesome food at a great price during the early bird special. Service was fantastic, however I would NEVER go here again. The temperature in the restaurant was UNBEARABLE---granted it was a hot day but our party of 10 could not enjoy our meal due to the sweltering condidtions in this place. The elderly guy at the table next to us was overcome by the heat and had to be removed from his table. Great place---HEY OWNERS, put a little $$$ into the place and get the AC up to snuff. What a shame! Go to Gulf Stream 2 times a summer. everything is A 1. We make sure we eat @ Gulf Stream if we do not eat any where else. Can not beat the price, food or service. If you do not go it is your bad. Ate here for dinner last night. Excellent! Food, service, view and atmosphere. Although it was a long ride from North Myrtle Beach, it was worth it. Will reccommend and return often. Tip: Ask for a table by a window for the best view and make a reservation. Hostess was unfriendly and rude from the moment we walked in. Did not speak but simply picked up menus and began walking toward a table. She asked " Did you make a reservation?" and I replied "No." I asked if we could be seated by the window. Her reply, "No. That's reserved." I think,at the least, her reply should have been "I'm sorry, but that table is reserved". We didn't even rate "Enjoy your dinner".Order apparently was lost as we waited approximately an hour and a half after appetizers for entrees to be served. No explanation nor apology from waitress for excessive delay. Restaurant was not crowded as there were only two other occupied tables in our section. Both of them, including a party of eight, were seated and served after we were seated. Salmon was overcooked and vegetables were cold. There are other restaurants in the area that offer fine dining on a par with Gulfstream Cafe that employ friendly staff and convey an appreciation for someone willing to spend a couple of hundred dollars with them. We are local and that was our last trip to GC. Ate there Saturday night, March 5, 2011. Hostess very unfriendly and bordered on rudeness. We had appetizers which were very good then waited over an hour and a half for meal to be served. A table of eight, who came in after we had finished our appetizers, was seated and served before we were finally served our entrees. I happened to look up and see realization on our waitress' face that we had not been served and watched her hurry into the kitchen to track down our order. When it was finally delivered, not one word of explanation or apology for the extreme delay. We spent over $300.00, including tip, and I can assure you we will not return. I am certain that we can find a restaurant where customers are actually appreciated. Great Place!!!! We come every time we are in town. Servers and Management are top notch. They do take reservations for after 6pm and it is worth it to make one. The family went to here to eat good food tonight. We have been before. The hostess tonight was very persistent about sitting us where she wanted to, not where we wanted to sit. Then the manager came to the table after we had ordered our food and was very rude to us, because the hostess had complained. He did not even want to hear our side. He just took her word. The waiter was excellent and the food was excellent. All around great experience. We went for Sunday brunch. Food was fantastic and the service too! We will recommend to our friends. We live in NMB and don't get down this way too often but we will return soon. Try the build your own bloody mary bar..Excellent idea at a great price! Zeke was our server, ask for him. May be the best dining experience on the grand strand. We have eaten there 2 times per week on each visit to the beach for the last 9 years. Service is great, views of Murrels Inlet stunning, and the best seafood,steaks in the area. Excellant food! great price. We have been eating there for yrs when we visit myrtle beach, we hit the early bird special, just enough for us and still have to ask for carry out. Service is excellant, romantic aptmosphere all yr long!. GREAT BRUNCH, EXCELLENT DINNER! We saw at church that they do brunch. It's not a buffet. We went with the recommendation from the server, crab omelet!!! We will be back for sure!! We had been many times for dinner and never disappointed. Now we can go on Sunday afternoon too! Thank you GulfStream Cafe for a build your own bloody mary!! Lots of olives, pickeled things, bacon, shrimp and even slim jims!! See you Sunday! We had been to the Gulfstream a few times in the past and have had good food and the early bird prices are very reasonable. My family was visiting last week and we decided to take them. It was not easy getting the 7 of us ready and to the restaurant by 5:30 for the special, but we made it. We were told when we arrived that they had sold their limit of specials and we would have to pay full price. I think this is a terrible policy. It is Oct. and the place was not crowded, I think if they have an early bird special they should honor it. We left and will not return. There are too many other good restaurants in MB to have to deal with this type of practice. This was our second visit to Murrel Inlet and we are glad we found this gem of a restaurant. Besides the amazing sunset, the She Crab soup was the best we ever had. Portions were way generous. One suggestion would be to order appetizers and share 1 entree. More than enough food. Make sure your battery is fully charged on your camera. The sunset is breathtaking and the sky changes a 1,000 times during your meal. Would recommend just going for a drink also. This was our first and last visit to this restaurant. The entire staff from beginning to end was very unfriendly. I ordered shrimp and oysters and got shrimp and fish. They took my plate back and finally returned with it and the baked potato was too cold for the butter to melt. We could not get drink refills. I asked for extra dressing and the waitress came by our table after another waitress had brought our food. She said I didn't make it back with your dressing, do you still want it??? Our salad plates had already been taken. Duh? I would consider the taste of the food below average. Never again do I want to go back there. Best food and service...the view is like no other. Thanks for the tip on the she crab soup. Had been to gulfstream before but i hadn't tried it until now. Awesome. By far our most favorite restaurant in Grand Strand!. We never visit without dining at the Gulf Stream. The "early Bird" is our favorite and we have never waited for a table. The calamari and filet mignon are amazing. My husband and I both agree their She Crab soup was some of the best we' d ever had. However the oysters were small and not meaty. The sea scallops seemed a little greasy but tasty and not overdone. Would definately go back for the soup alone ! My wife and I made last minute reservations. We sat outdoors. Beautiful scenery, likely the best in Murrell's. The She Crab soup was truly as good if not better than the reviews posted on here. If you want soup and salad (cobb salad), this is the place. I enjoyed layers of king crab legs grilled to perfection. Prices were reasonable considering the rich flavor in everything consumed. The sun setting, great food and wine. No better place. I ate here on Friday Aug. 20th 2010. I was very disappointed in my food. I ordered flounder and scallops,they brought me oysters and scollops. I sent my plate back and do not know what kind of fish I got, but was not flounder. The server said all the fish looks alike back there in the kitchen. The scollops were ok. It was very warm in the restaurant,my ice in my tea melted really fast.I do not know if I will go back. We had a party of 4 and waited about 45 minutes to be seated. That was okay but it was very warm in the bar area. The food was a very big disappointment. Now I know why we hadn't heard much about this restaurant from our friends here. The New York Strip was very tough and when I complained they offered to bring me a fillet. I accepted and was charge for the fillet. I think I should have been refunded my money for the New York Strip or given the fillet at no additional charge. The others in our party were also disappointed with their entrees. We won't be going back or recommending this to our friends. We are locals. Been going there for over 30 yrs. It is always our last meal before we head home. The setting, the service, the food, the location, everything has been excellent. If you had to end a vacation, this is the spot. My favorite place to eat, everything was great ,the food was great and the early evening Menu is realy a great value and is super good. My wife and I rate this Myrtle Beach's best restaurant. Great food. Superb atmosphere. We finally found the Gulf Stream a few years ago after staying at Surfside for almost 20 years! A friend recommended it about 4 yrs ago and we're so grateful. The food is always delicious! The early bird special is amazing at $10.95.. but you better get there a little before the early bird time if you don't want to wait! Even if you miss Early Bird hours, the regular menu has always been fresh and delicious! I lost my precious wife to cancer in August, 2001. Prior to that Gulfstream was our favorite restaurant ever and we had eaten at some of the best all over the world. We always got a window seat (we were always willing to wait for it). The good folks that own Gulfstream have no idea how much memories are a part of all that they do for so many. Thank you so much for being part of my memories. The last time I went, there was an empty chair across from me, but I waited for a window seat and was thankful for the 29 years we had together. The simple dining pleasures my wife and I had there were made even better because of the great service we always experienced. May God continue to bless your business. We have eaten at gulfstream cafe three times within the last 5 months when we made trips to surfside beach. I wanted to rave about the service and the food as well as the live entertainment. We had two recent experiences that prompted this review. On october 17th, my husband and I took my brother and sister-in-law to gulfstream for dinner. The food was outstanding! the service was superb. The waiter, brett, was really helpful in securing a specialty order and his attention to us was awesome! last night, october 22nd, we went for the "eat all you can shuck oysters" and the live entertainment. The all you can shuck for 15 bucks for oysters was really great. I don't eat oysters but my husband does and he loved it! double exposure performed live entertainment while we were there. We thoroughly enjoyed their performance! of course they had beach music selections but they also had a mixture of many different songs that we really enjoyed. They were great at involving the crowd and were very personable. There was space for dancing that was an added plus. I did not get the name of our server but she was great! it was really busy for her but she did an outstanding job! my brother introduced us to gulfstream back in june. He is a real food lover and spends lots of time looking for great restaurants. Great personal service is especially important to him, so I know he would not have introduced us to the restaurant unless it impressed him. I hope this explains my 5 star rating of our dining experiences at gulfstream. Anyone looking for a great dining experience should check it out!. I hope you will consider this very old review of Gulf Stream Cafe written from memories of one of my favorite restaurants in the world. My family and I were residents of Surfside Beach some years ago and this was the eatery of choice for entertaining business guests and visitors as well as personal special occasions. There was always some wait, but you knew that going in, particularly if you were a local and you understood that it was tourist season. If it was July or August and you were cranky or over hungry, you made a decision to wait for that wonderful shoulder season in Sept. & beyond to have things the way you wanted them. The She Crab Soup, the salads and the fish were always great, but the star of the show was the fabulous sunset with fishing boats floating in to dock (You didn't need to see the ocean at the same time to try to compete with that scene!) Dinner at The Gulfstream was the feature of the evening and an Inlet side table for the big show and good conversation was worth setting time aside for. We'll be back some day! Wonderful brunch!!! Not a buffet, reasonably priced and delicious. Server was delightful. Try the crab omelet and mimosas! We have eaten there for 20 years and understand waiting but last week was over the top. There were tables with no one there and we still couldn't get a table. The icing on the cake was the 18% tip because my husband and I with 3 children made a table of 5. I will re thinking eating here ever again. The waiter was slow and didn't care because he know he had his tip!. Had our anniversary dinner last night at the Gulfstream. 10 years! It was a perfect evening from beginning to end. You must try the she-crab soup. It's is amazing! We are never disappointed at the Gulfstream. Excellent service. Ask for a window table for the best view! We dined at Gulfstream Cafe on Thursday 7/23. We had a reservation and had to wait. We always make reservations to be seated right away. We didn't mind the wait because we were told we would have to, they were running about 30 minutes behind so we had appetizers and cocktails on the deck. Not sure what the problem was or why we had to wait so long. The view was amazing and the young man playing music on the deck was definitely a distraction from how long we waited. Not to mention he packed in a huge crowd. The manager and host apoligized several times. We were happy to have been acknowleged by them and not just ignored. The food was delicious, I had crab cakes and my husband had crab legs. The manager was nice enough to buy us desserts to help to make up for the long wait. I think the food, service and free desserts were a good apology and we will recommened this restaurant to all of our friends. Of all the times we have made reservations this was the first time we had to wait but we will return. Do not eat here. Our reservations were for 6:45. We were not seated until an hour later. Okay, not so bad... but it took forever to take our order and our food did not arrive until after 9:00. What a joke. Please do yourself a favor and go someplace else. After my neighbor mentioned the place we decided to have dinner there on 6/11/09. We were told of the early specials with great selections and good size quantities for the value. Well, the atmosphere was great, but you can't eat atmoshpere. I ordered the fried seafood platter(choice of 2 items) and I opted for shrimp/oysters. The shrimp were thumbnail size, as were the oysters. I got 3 of each. The baked potato was cold, as were the veggies. After we had a total of 2 cocktails, the liquor bill was just about twice that for the food. I've never seen such poor quality of food, let alone the size. I've had bigger salad shrimp and oysters on the half shell. Overall, the value for your dollor is just not there. I in all good honesty can't see how they stay in business, except for the "hype" that it's the only restaurant where you can see the ocean and inlet at the same time. This is bunk also, unless you're sitting at the highest level where the bar is. Does this give you a clue??. This is by far the best restaurant in the Surfside Beach area. My family has had a house in Surfside for about 20 years and have tried every restaurant within 10 miles and you cannot beat Gulf Stream! The early bird special is a fantastic deal and the magnificent views and atmosphere are incredible! The food and service have always been great. I would recommend this to anyone! I have been dining here for at least nine years with the last two (this year is our third) reserved for our wedding anniversary. I just called to make the reservations and can't wait to get there. The service and atmosphere are just a tease for the quality of food one receives. The restaurant is located right on beautiful Murrells Inlet and the outdoor decks offer great settings for photographs. I have had nothing but great experiences at the Gulf Stream and highly recommend it to a few. I do not recommend it to all as I selfishly wish to kind of keep it to myself!!! We have been staying in Garden City for years but only discovered Gulf Stream in the last few years. The early bird special has to be the best value in the grand strand. 10.95 for a meal that includes bread, a salad, entree and a drink. We went twice this past week and it was wonderful both times. The view is fantastic, service is wonderful and the food is very good as well. I would recommend this restaurant to anyone. The restaurant is a favorite of ours. Last night we took visitors there for the early bird special. I believe this is the best value you can get anywhere. I had a salad, bread, 2 fillet mignon medallions, baked potato, mixed vegetables, just the way I wanted it, and the cost was 10.95. We had window seats looking over the marsh, it was beautiful. Our friends had fish, and were extremely happy. We recommend highly. Favorite restaurant in the myrtle beach area! fantastic food great atmosphere, only restaurant in the area where you can the sunset. Awesome we go every year!. We have dined at Gulf Stream for years and send many friends there.. We always are pleased and sometime we go early a nd enjoy the early specials. What a great place! We enjoy the great view and the wonderful food. Our second visit this year. We took our out of town family. They were very impressed with everything. We have found our favorite restaurant. Four of us went on advice from a friend,The veggies were kind of bland.The crab cakes were not cooked all the way,I ordered lobster tail at 54 dollars and calamari and they forgot my tails,they did apoligize and didn't charge me,AAA+++. Other than that,It is a great setting and great view. The whole dining experience was fabulous. It wasn't very busy at this time of the year and we were seated immediately with no reservation. Our waiter, Randy, was superb, we didn't have to ask for anything, he was there for us. The food was beyond expectation and well worth the price. We will definitely go back many times. A must when we are in Myrtle Beach. My husband dislikes seafood, but enjoys eating at the Gulf Stream because the steaks are wonderful! I have tried most all of the seafood items on the menu! Always fresh, always great!!!! A must to eat it! We visited this restaurant on New Year's Eve! Can't rave enough about it! This place is great. It has a great view of the boats and marsh. The food is delicious. I have never had she-crab soup like this - big chunks of crab - yum!! This is a beautiful restaurant. The seafood is excellent. My husband and I both had the fried seafood platters, which the cooks were very accomodating and broiled for us. The seafood was fresh and delicious. We each ordered a house salad. The salads were huge, and we could have easily split a salad. This was our first visit, and it won't be our last. I guess I am an "Old Timer" as we have been coming to Myrtle Beach for over fifty years. I cannot remember when I first visited Gulf Stream Cafe but I can tell you we go there to eat every time we are at the beach which is about every two or three months. I think the flounder is excellent and my husband loves the blackened tuna. I don't understand why people get bent out of shape about waiting...all GOOD restaurants at the beach have a wait!! Get over it! The stafff is always courteous and prompt when we are there. The prices are definately fair. Some people just like to complain I suppose. It is a great restaurant, good prices and a great view. 4 of us from Tillsonburg Ont. came here on Oct.24/08 for the early bird. Even though it was extremely busy, it didn't take all that long to be seated. I ordered the fishermans platter and the rest ordered blackened salmon. Mine was fantastic as were the others. Waitress was great and the prices were also great. We will be sure to dine here again. In my opinion, this is the best seafood restaurant in all of Myrtle Beach. We found this place last year on our yearly golfing trip and went back twice this year. I always order the lobster and steak and it is by far the best lobster in Murrells Inlet. The atmosphere is pleasant and the wait staff is excellent as well. If you like seafood, don't miss Gulf Stream!!! Just ate there with my two aunts & we had a delightful dinner, as always. We have never been disappointed nor have we ever had a bad meal & for people on a fixed income the early bird menu is very much appreciated! One aunt & I had the flounder & we both agreed we'd never had better! The other aunt had the filet medallionis & thought they were amazing. The atmosphere, cleanliness, service, food & incredible view are the best kept secret on the Grandstrand & we will most definitely be back to dine again! If you are anywhere near Garden City Beach, SC, you MUST visit the Gulfstream!!! The oyster shooters and she-crab soup are well worth the trip. Oh, and you MUST have the coffee!!! And, if you're very lucky, you'll get Rhonda T. to serve you. She is the BEST!!! It started raining the night we were there, but the view was still amazing. The food was great, and the service was even better! We've been coming to the Grand Strand for more than 10 years and the Gulfstream is our new favorite!!! Our party of 9 ate during the Early Evening Menu time the week of 8/24/08. The fresh fish of the day was salmon which was delicious!!! Everyone enjoyed the shrimp and flounder. The chicken parmesan was average - the marinara sauce was a little bland. Our waitress was excellent, taking our group picture when asked. We enjoy the food and the view. We'll go back on our next time to the beach. 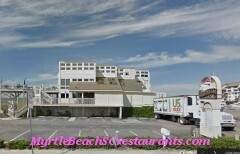 Gulfstream Cafe is one of my favorites restaurants in the beach area. I go every time I am in the area, sometimes twice, depending on the length of my stay. I have had the Beef Medaillions, Fried Shrimp, Shrimp and Oysters, Flounder. All are very tasty. You can't beat the price of the early bird special. OMG!! The food is great at Gulfstream. You have to try the BBQ shrimp appetizers for starters. I had the blackend salmon and cheesecake for dessert. It was great. If you go before 5 you get better prices. We ate there twice last week. Once on the "early bird" special and once at regular prices. This is a great family seafood restaurant. The best in the area, bar none. The food at the Gulfstream was a bit overpriced and the seafood platter was so-so, but without doubt, they serve the most wonderful and delicious she-crab soup that I have ever eaten (from the Chesapeake Bay to Charleston)! The service was very good for the large crowd that we went with.......thank you, Misty. I will definitely return to this restaurant on our next trip to the Surfside/Garden City area. I have had great food, good food and sometimes blah, but overall more times than not it has been good to great! I recently ate there and was very disappointed to see a charge for their house salad, especially the price. I was so disturbed I sent an email to the group and unlike the prior reviewer I did get a response and even a phone call. The manager explained why the charge and after doing so I understood their reasoning. I told her I loved the salads and yes they are much bigger which led her to say we could share. Anyway, I nice response and explanation from a great restaurant. I will be back! Well let's try this again. I have tried to review, but it doesn't appear. Anyway, the Gulfstream used to be one of my favorites. Visiting at least once a month I have seen ups and downs. Mostly the food has always been great and today it still ranks pretty darn good in my book. However, after going last weekend and having to pay $3.25 for my salad, I have had it. I always order my standard Grouper Francais which is always good, my garlic mashed and my salad with extra blue cheese. When I figured the rise in price this amounts to a 14 percent increase. Please raise your entree prices a little and leave the salad alone. Until it's included, uninclude me. Don't forget I am here all winter! Ev Surfside Beach, S.C. I've gone back to the resturant every time I vacation in the area. I'm especially fond of the she-crab soup. Service has been good and the view at sunset is awesome. There's plenty on the menu to please everyone's palate!! After patronizing this restaurant for many years it will be cold day in hell before I return. I have had great meals, sometimes average meals, etc. The service is good most times and poor other times. I really didn't care, because I felt for the price and quantity of food it was worth the risk. However, this time I couldn't believe it. They now charge $3.25 for their salad, which was always included in the price of your meal. Since I always order my standard Grouper Francais, this amounted to a 14 percent increase in the cost. I know food costs are up so why not add a couple dollars to the entree, but not 14 percent. Count me as a past customer until this is rectified. Upon reading some of the reviews below, I had to comment. I can promise everyone that drinks would never take 45 minutes to arrive at the table, no matter how busy the resturant was. And considering the time with the Encrusted Tuna mishap, I know the manager they are talking about (and probably going a bit overboard when explaining it) doesn't work there anymore. Just remember, just treat the servers with some respect and they'll show you ten times more. The Gulfstream has had it's problems but it comes with the business. My family (all 15 of us) have enjoyed Gulf Stream for several years now. The atmosphere is simple and elegant. If you get your name on the list by 5:30, you are guaranteed the early bird menu regardless of when you are seated and it is the best value on the beach. I always have the filet medallions with basmati rice and vegetables. Out of this world! The veggies are your standard broccoli/carrot/cauliflower mix though, used to have yummy squash and zuchini that was much better and less run-of-the-mill. The homemade dressings are super and they have the absolute best she-crab soup ever made! We would gladly pay more but the early bird price is unbeatable. The only downside is the wait time, its crowded every time we go but its well worth it. Our family makes it part of being on vacation to eat out each night, and we often go to Gulf Stream twice during our stay each season. We've been winter rentals for 8yrs.in Myrtle Beach,S.C. and always went to the GulfStream at least 2-3 times a month. Our friends had never been,so we took them to our favorite spot. The only complaint was the baked potatoes & steamed veg. were COLD. The butter wouldn't even melt on mine. We had early bird specials of seafood platter and filet mignon medallions. We'll still go back,but was disappointed because it was their first time. Absolutely everything else was great. The food and atmosphere were excellent; however, the portion sizes are WAY TOO SMALL for the prices. Service, etc. were excellent. Go for the early bird special when they first open. Definitely the best value. Food is excellent. If you dont get there early there can be a lengthy wait. Will be going here again in a couple of months. We had reservations for thanksgiving dinner at 5:30pm.arrived at 5:15 pm and was told that they were behind on seating and it would be at least 30 minutes.one hour later we were still not seated.i asked the host about this and she said she would check on it.about 30 minutes later she told me that she could not seat me up stairs where my reservations were made for and that we would have to sit down stairs or either wait a little longer.by this time it was almost 7pm so we had to sit down stairs where we did not want to sit.remember my reservations were for 5:30 pm.. The food that we ordered was undercooked twice... I orderd a salad that came with way too much dressing on, so much so that is was has a though the salad was the dressing on the sauce. The atmosphere was depressing as a couple behind me we breaking up. IT was WAY to expensive. I had to wait 3 hours to be seated. It was extremely loud inside the resturant. I always sit in the bar area to insure immediate seating. I love the wait staff and food. As vegetarians my family and I always find dishes and salads to enjoy. The kitchen does not seem to mind preparing our choices. We did learn to stay far, far away from the early bird after being attacked by a group of gray haired couples for being seated upon arrival. Also, the smell of stale powder and old cologne was enough to choke us in the lobby area, my son put his shirt over his face. Once you get away to the bar, all is peaceful and delicious. The food was very good. We went for the seafood. Their were some sophisticated/higher priced seafood items on the menu, however, the seafood platters were moderately priced - about $17 for a combination platter. The scallops were delicious, and the flounder was good. My wife and mother-in-law had the fried oysters, and said that they were very good. I would recommend this to anybody, and will visit again on our next trip to MB. Make reservations on the weekend, or you will probably have to wait 1 hour plus to get seated...very good view of the inlet, especially at sunset. Like most of the other reviewers, I found poor quality food and substandard service. It took 45 minutes for our drinks to arrive. The appetizers were tasteless. The "oyster shooters" were missing the splash of vodka that makes them "shooters". Myself and another of our group ordered the crab cakes. They were mushy, watery, oversalted and inedible. What a waste of $23.95. My husband ordered grouper special and it was nothing like the menu item that was quoted by the waitress, and he did not care for it. The food was so poor I sent an email to the Centra Archy group, and they did not even give me the courtesy of a response. There are so many wonderful restaurants in this area, don't waste your time or money here. 8-16-2007 We heard about this restaurant from several local people and decided to try out the early bird specials. ($10.99 for entree, salad, bread and drinks) We have 4 boys ages 19,16,14 and 9). At first glance at the specials they thought that they would go home hungry but after eating our meal (also ordered the onion loaf and extra hush puppies- a must ) they all commented on how good the food was and only one of them could finish their food. When we arrived we were told that there might be a 40 min. wait but we were seated in 15 min. The atmoshere is white linen table clothes, large windows overlooking marina and large wooded beams. The only down fall was that the childrens menu was very limited if your child doesn't like seafood. We ordered salmon,filet mignon, shrimp and scallops and enjoyed every one. I would highly recomend this restaurant. We love the Gulf Stream. When we are at the beach, we usually go around 5:00 to get the early bird menu and it is great. The food and atmosphere are wonderful--a view of the ocean on one side and the Inlet with the sunset on the other. Dining just doesn't get any better--the White table cloths; pleasant, friendly servers; delicious food; unbelieveable atmosphere. Suggestion: Install ceiling fans inside and on the back deck to help with the excessive heat in late summer. The Gulf Stream--Our Favorite!! !